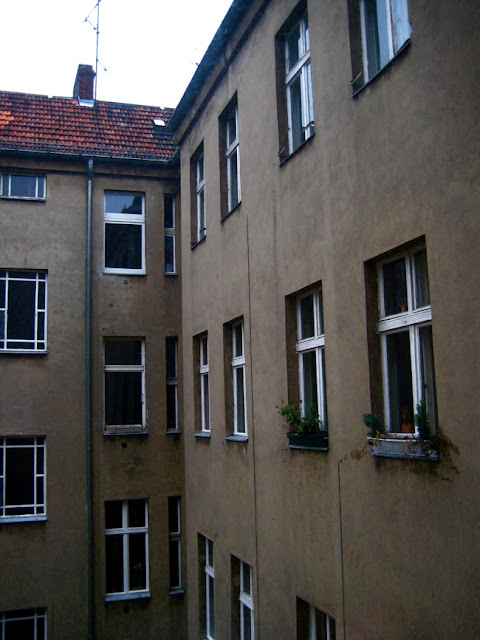 I sit at the table by the kitchen window and look into the apartment's hinterhof courtyard where rows of windows frame five floors of lives. At night you can stand in the window with the light off and try to learn something about your neighbors but now it's daylight. 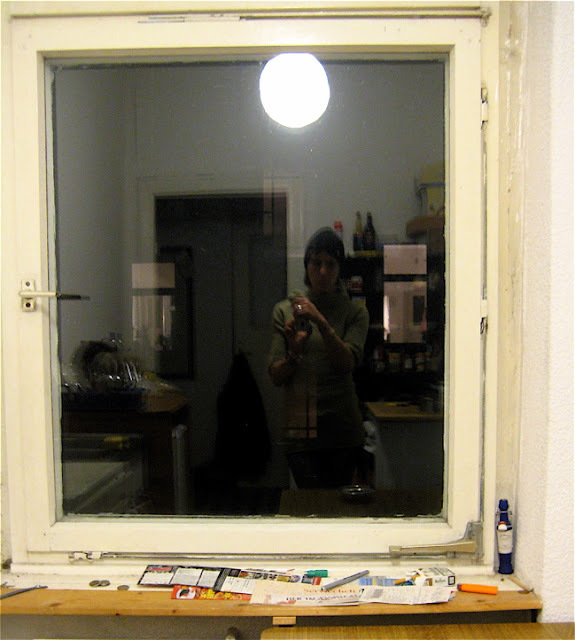 Milan, Charlie's housemate, walks in the kitchen from his bedroom and, surprised, we both half-smile shy hellos. We haven't spoken before. The last time we were in the apartment at the same time, he scurried by the kitchen on his way out the front door and grunted. I grunted back because when I don't speak a language, I mimic. I was looking at a silver necklace at the flea market and the woman asked me in German, "Nice?" Instead of answering, I imitated her, "Nice?" with the exact same inflection. If I'd known the word at the time, I'd have swapped punctuation marks. Instead we stood and stared at each other with the question hanging between us. Milan asks if Charlie is still asleep. He needs rent. I don't know why he's asking, though, I just think he wants to chat. "Yes," I tell Milan, "We got home late, at seven-thirty this morning. Charlie's still asleep." "I was born in Germany but lived in Yugoslavia, in Serbia," he says, "Where are you from?" He looks surprised for a second time, first to find me in his kitchen and now to learn that I'm American. "You were born there?" he asks. "Born in America, too," I say. He looks at me silently and I remember Charlie telling me how much anti-Americanism there is in Kreuzberg. I wonder. We are both silent. He lights the propane hotplate. "Charlie stayed with me when I lived in New York so I'm here as payback," I offer. I don't know if he'll understand that but he smiles like he does and repeats, "Payback." He asks if I like Berlin. I do. I look out the window, at the early afternoon clouds, and say that I'd just like to see more of the city in the daylight. It's dark by four in the afternoon and for the first time in a long while, I'm sleeping well, until noon every day. I've mostly seen the city by night. I tell Milan that I'm here for just a few days but that I may return in the spring, when I'll have more time to see the city by day. He offers me Turkish coffee and then retreats to his bedroom. "Thank you," I say. "Thank you."